Dining at the top of Burj Khalifa may be something else. But what is the view like? A whole lot of sand. 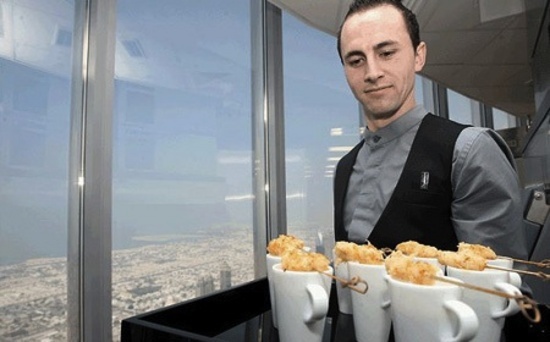 Fine dining at At.mosphere, the world's highest restaurant in the world's tallest building. For now that is. The restaurant is located on the 122nd floor, and At.mosphere has the privilege of calling itself the highest restaurant on Earth. Food is inexpensive, with lunch costing $80 and dinner $121 per person. Its fairly cheap if you consider the fact that going all the way up there is kind of luxurious in a lot of ways. Perhaps its a trade off from having to look at a whole lot of sand from the top.